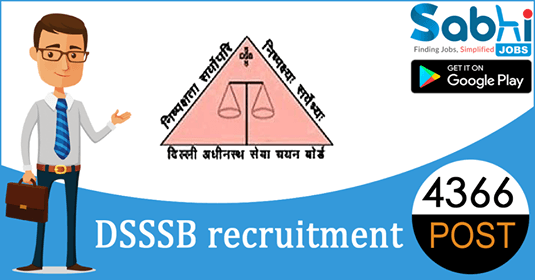 DSSSB recruitment 2018-19 notification has been released on official website www.delhi.gov.in for the recruitment of 4366 vacancies at Delhi Subordinate Services Selection Board. The candidate who is looking for Teacher (Primary) can apply online application from 2nd July 2018 and before 30th July 2018. Qualification Senior Secondary (10+2) or Intermediate or its equivalent from a recognized board / institution OR Two year’s Diploma / Certificate Course / in Elementary Teacher education Course/ Junior Basic Training or equivalent or bachelor of elementary education from a recognized institution and Must have passed Hindi as a subject at Secondary level and Must have passed English as a subject at secondary or senior secondary level and Candidates must have qualified CTET. How to Apply Interested and eligible candidates may apply online application form at official website www.delhi.gov.in from 2nd July 2018 to 30th July 2018. The vacancies advertised are provisional and liable to vary. In case the vacancy position is reduced to any number or even nil by the user department, Board is not liable to compensate the applicant for any consequential damage/ loss. The vacancies in equivalent/ comparable posts can also be filled through this advertisement. UR-Unreserved (General), SC- Scheduled Caste, ST- Scheduled Tribe, OBC- Other Backward Classes, PH-Physically Handicapped, OH-Orthopedically Handicapped, HHHearing Handicapped, BL- Both Leg, OA- One Arm, OL- One Leg, OAL- One Arm & One Leg.